Availability. Everyday 09.30 – 18.30. Pick up. Various from hotel or pick up points. 2 Hour Horse Riding €55. Return transport is included to and from the stables and we pick up from all hotels in the tourist resorts in South Gran Canaria. Playa Del Ingles, Maspalomas, Puerto Rico, Melonares and many more. Upon arrival, all belongings are placed safely into into your locker and it’s time to be matched with your horse. The instructor/leader asks each of you in turn if you have any previous experience with horses. Those without any experience will be matched with the plodding type of horse, which will go slower to ensure you feel comfortable throughout. Those who have ridden before will be matched with a horse with whom they will be able to canter on, later in the day. Hats and hair nets are provided and instructions given by professional and friendly staff. 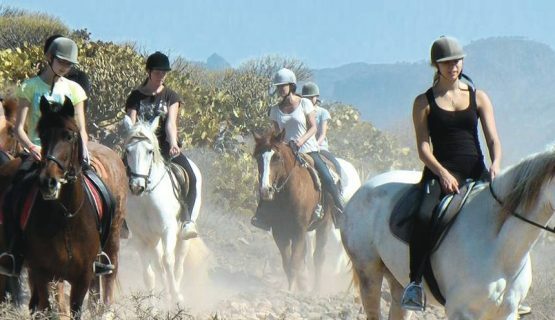 The trek is fantastic and you will ride over rough terrain and rocky landscapes and see amazing views across the dunes of Maspalomas, the sea and the mountains. 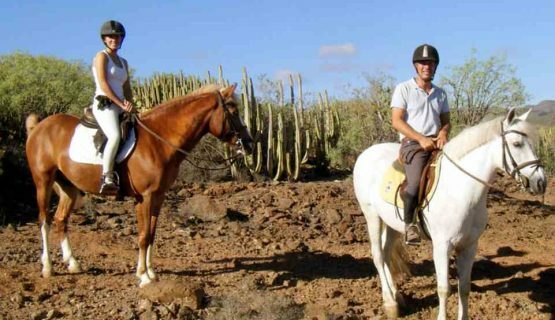 This is the best riding stables on Gran Canaria and the lovely staff will always see your enjoyment and safety their priority. It is very important to book in advance to avoid disappointment, as only 12 people and 12 horses can go on the trek together. An additional highlight of the day is that photographs are taken throughout your trip and they are put on to a DVD so you can watch it back at home and relive your fantastic day. 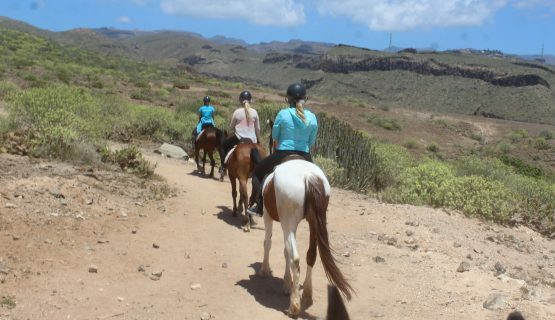 Book Now This amazing horse riding adventure in the mountains of Gran Canaria. Experience breath taking overhead views of the beaches and coastline. Duration. 1 or 2 hours. Price 2 Hours Adult €55 Child €55. Price 1 Hours Adult €39 Child €39. Well trained horse for beginners as well as more experienced riders. Stunning rides with fantastic views of mountains and the sea and beaches.Photographs provided on DVD as a memento of your ride. Professional and friendly staff. Those who have ridden before will be matched with a horse with whom they will be able to canter on, later in the day. Hats and hair nets are provided and instructions given by professional and friendly staff. This is the best riding stables on Gran Canaria and the lovely staff will always see your enjoyment and safety their priority. It is very important to book in advance to avoid disappointment, as only 12 people and 12 horses can go on the trek together. Click Book Now, select your date and time slot and reserve! The Remaining Balance of €40 to be paid on the day.